It’s quite simple. The wind blows, turns blades, and out comes power. Wind has been used for centuries to all manner of replacement for human labour, how can they have a problem producing power? So we are going to concentrate on what basics are used to do the analysis here. This is the capacity of a single wind tower or groups of towers added together. The name plate of a single tower is the maximum output at maximum wind speed. The name plate of a group of towers that make up a wind “farm” is all those single capacities added together. “The net capacity factor of a power plant is the ratio of the actual output of a power plant over a period of time and its output if it had operated at full nameplate capacity the entire time. To calculate the capacity factor, total energy the plant produced during a period of time and divide by the energy the plant would have produced at full capacity.” [Wiki] Thus the capacity factor is just the average over a year. “the capacity value is defined as the average hourly wind power output during the periods when load is within 10% of its peak. This is per unit of the wind power output nameplate rating.” [IESO] Capacity Value is then just the Capacity Factor only during peak consumption hours. However, some rightly argue that because wind is not available as needed on demand, has to be backed up with convensional sources, it has no capacity value at all. See also this paper from the US. This analysis is going to introduce three new measures for wind output, vital in understanding what is going on. This is the per hour output divided by the capacity. It’s the same as the Capacity Factor above but instead is calcuated for every hour of production, or non-production for hours there is no wind. This is the point where half the number of hours for each Hourly Capacity Factor are above and below. Its when half the time the output as a percent of name plate is below that value. Because the output profile is highly skewed to the low end, the Median Capacity Factor is less than half the Capacity Factor. This is the percent of time there is no output from wind, regardless of the reason. Most of the time this happens because of insufficient wind speed. It will become appearent that the Zero Capacity Factor is very close in value to the Capacity Factor. So when some claims that wind’s output is 30%, you can counter and state with confidence that also 30% of the time these turbines produce nothing at all. The Capacity Factor is an important number in the wind industry and is used when they have to justify their projects. You will often see capacity in news articles. That is name plate. When those articles claim x number of homes can be powered, they use the Capacity Factor. Example, a 1.5mW turbine is the name plate. If the wind company uses a Capacity Factor of 30% they use 1.5megaWatts times 0.3, or 0.45mW of power (450,000Watts). As you will soon see, Capacity Factor is a completely meaningless measure of actual output. It gives a completely wrong impression on the performance of IWT. Because of this, those planning wind projects will use the Capacity Value. In all cases the Capacity Value is much less than the Capacity factor, by a lot. 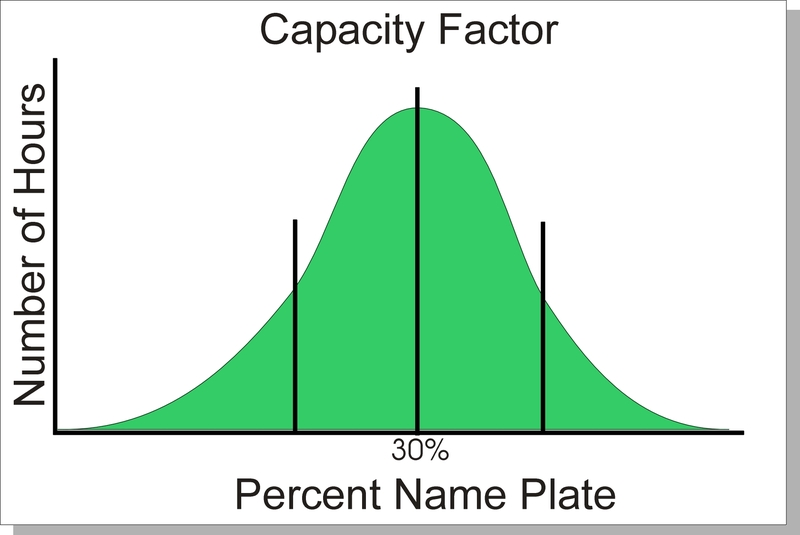 Example, the Capacity Factor may be 30%, but the Capacity Value is only 10%, or less. The process that will be used here as a measure of output is quite simple. Each hour of output is plotted as a percent of name plate vs the number of hours at each percent name plate. That is, the values to the left of the average, the Capacity Factor, would be the same as the values to the right. In this case, the number of hours at 30% is the highest, and there would be as many hours at 10% name plate as 50% name plate. That’s the impression given when the wind industry uses the average as the capacity factor. They do not want you to know what is actually going on. Now, another important number which you will rarely see that is vital to know is the Standard Deviation (the vertical lines left and right of the average). Without getting technical, the SD is the measure of the width of the bell curve. The smaller the SD the narrower the bell shape of the curve. The larger the number the wider the base. Notice how most of the values are to the right of the average. The average no longer has the most number of hours. 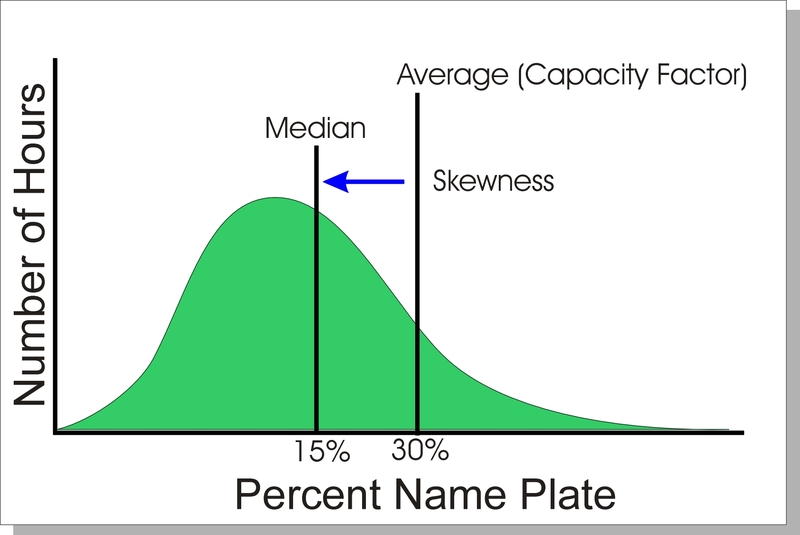 The important numbers on a skewed distribution is the median and skewness. The median is where 50% of the values are to the right and left. This means, half the time the number of hours are below that name plate percent, in this example, 15% of the name plate. Let’s be clear on this meaning. Median is 50% of the time the output is below that percent name plate. This makes the Median Capacity Factor a far more understandable and realistic measure of wind output, not the average. Median is the true capacity factor, not average. The bigger the skewness, the more the median deviates away from the average. At zero skewness the median and average are the same, and the graph is a normal distribution. The bigger the skewness in the positive, the more the median heads to the Y-Axis. The Standard Deviation is then on either side of the mean in a skewed graph, not the average. Now you are prepared for how this data is analyzed. The data was downloaded and inserted into an MS Access database file. This allows for SQL queries to be run on the data, which was then copied and pasted into Excel for plotting and statistical calculations. This entry was posted on Tuesday, September 14th, 2010 at 2:08 am and is filed under Uncategorized. You can follow any responses to this entry through the RSS 2.0 feed. You can leave a response, or trackback from your own site. I know you are trying to make this really readable and easy to understand, However, your first graph states that the “average” is equal to 30% of nameplate; I really don’t know, but I believe that actual outputs vary drastically and run a lot at “0”. Your graph shows very few readings of “0”. So, this is not a graph of “real” IWT output. Neither is the one with a skewed bell curve. It would really be interesting to look at a real graph. The “real graphs”, that is from the actual data, are throughout, with lots of zero output. Just a clarification, the second graph is skewed to the right, not to the left. In that case, the mean is greater than the median. The second graph is a positive skew, tending to the left. I am struggling to comprehend the meaning of nameplate capacity for wind farms. At Wolfe Island Wind Farm at nine this morniing it was producing 56 MW of power. The nameplate capacity for that farm is 197.8 MW. So if if I calculate…does that mean it is operating at 28.3% of its nameplete capacity. I am very curious and interested and I would like to understand the Sygration site a little more. . Make it real simple please. You are correct, for that one hour, the output was only 28.3% of what the turbine is rated to produce. That was a very good day actually. Most hours are below that. It was high this weekend because of the weather system moving through the province. Soon as a high pressure cell settles over the province next week watch that value plummet to less than 7%. The sad part is we dont need that power those turbines produced. We likely dumped it, at a loss, to the US. That means YOU paid for the US to take that excess power from those turbines. Any further questions feel free to post. of my previous room mate! He always kept talking about this. Why Wind Won't Work? – it's Weaker than Water.